Once again we were asked to create some planters which would incorporate some steps to the entrance of the temporary marketing suite. The objective was to make the structure more welcoming to visitors and add a splash of colour to an otherwise bland area. As you can see we were able to level the planters, as the ground they were to stand on was uneven. Again we planted with some evergreens along with some annual and seasonal plants for colour (these can be changed with the seasons to keep them looking fresh). I think you will agree they are looking pretty impressive. Just a few finishing touches were needed to complete the project. We added a picket fence on the left hand side and some handrails were attached to the steps, the gaps at the bottom of the planters and the steps were covered. Despite us having snow on day one of this project and the second day being sunny but extremely cold, this job took two people just 1.5 days to complete. 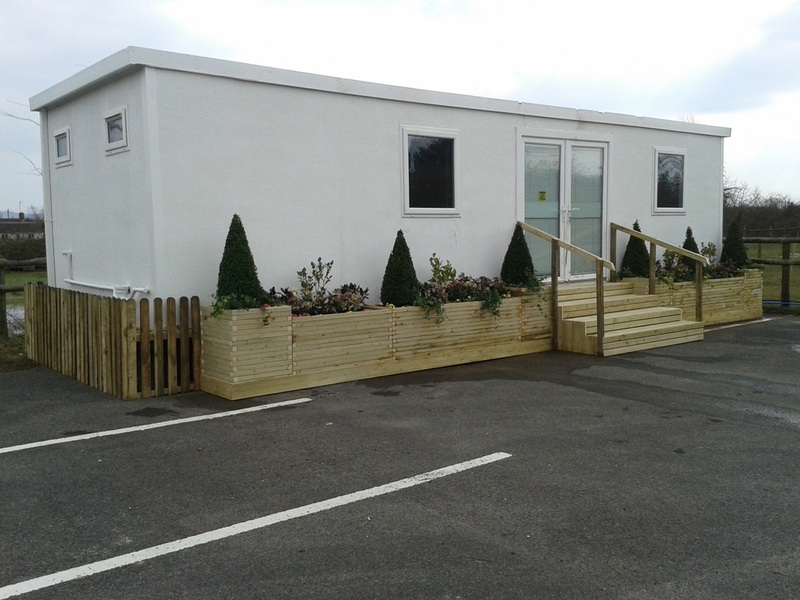 When the site was visited by the area sales manager she was very pleased with the end result. Love these planters, can they be made different sizes and heights? I would also like to paint them to blend in with the wall. Would this work. Great idea especially for around out buildings. I have a portacabin on a hard-standing that I use as an office at the end of my garden, something like this would make the structure less obtrusive. These planters would look great at mine as i live in a mobile home. They are a complete garden within the planters easy to maintain I would imagine too. Please will you post some photo's when they are more established and in full bloom.